The FBI is asking for the public’s help in finding three men behind a series of takeover bank robberies, including three heists of Bay Area banks this week. In a total of four robberies, FBI spokesman Peter Lee says holdup men entered the bank before jumping behind the tellers’ counters and holding customers in the bank as they took the money before fleeing. The most recent robbery took place Thursday, with a Bank of America branch in San Francisco’s Parkside district being held up. 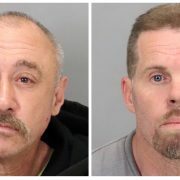 On Monday, three men are believed to be the same gunmen held up a Metropolitan Bank branch in San Francisco and a Cathay Bank in Millbrae. They’re also believed to be responsible for the robbery of a Wells Fargo Bank in San Francisco on April 19. The FBI is warning that all three suspects are considered armed and dangerous. Witnesses say they saw one man with a gun during two of the robberies this week, but that more than one of the robbers was armed with a handgun during the April robbery. The FBI released surveillance photos the men in three of the robberies. The suspects are described as black males, approximately 20-35 years in age, slim to medium builds, wearing thick jackets, gloves, and clothing that would mask their heads and faces. One of the suspects is between 5’8” and 5’10” tall and the other two are between 6’0” and 6’2” tall.